Are the walls at your event venue ugly,have huge photos that need cover, or the event space needs to be converted from natural walls into an elegant event venue. 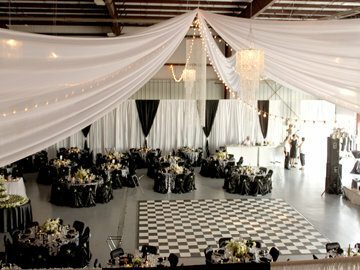 You can easily transform and define your event space with the use of wall draping. Includes pipe, plates, uprights, crossbars, and drapes. Please note, this pricing does NOT include setup and tear down fees. Please call for that pricing. This pricing, however, is all-inclusive for DIY setup. You can pick up and return items at either our West Des Moines or New Sharon locations. We do not ship this item! Pricing does not include setup or tear down fee. Call for pricing for setup.